Year after year, the world is seeing more frequent extreme weather events, whether it is droughts, extreme temperatures, floods, or severe storms. These weather events can have immediate and undesirable impacts on water treatment facilities and the health of receiving water bodies. For wastewater treatment plants, large amounts of rainfall or snowmelt can outpace peak flow capacities resulting in sewer overflow, where untreated (or partially untreated) wastewater is discharged, polluting receiving waters. In combined sewer systems, overflows contain not only human waste, but industrial and toxic waste. The pollution caused by combined sewer overflows (CSOs) is becoming a priority concern for countries around the globe. Enter INTCATCH, a Horizon 2020 program funded by the European Union and led by Brunel University in collaboration with 20 partner organizations across seven countries. The team is installing CSO treatment systems along with state-of-the-art monitoring tools that can measure water quality in real-time. The vision is to build the program so that any city or town can use these systems and tools to uncover how best to improve the health of their water source affected by CSOs. Villa Bagatta, Italy, lies on the coast of beautiful Lago di Garda (Lake Garda) and is home to one of five INTCATCH demonstration sites, with other sites located in the UK, Greece and Spain. Lake Garda is the largest lake in Italy and a very popular tourist destination. They currently have 22 pumping stations and gravity CSO channels and 10 submerged CSO tunnels, which were designed years ago when there were fewer peak flow events. 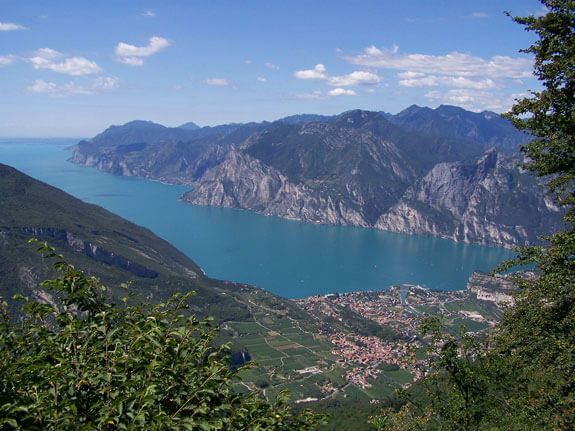 Now, with more frequent wet weather, Lake Garda is at risk of high pollution from CSOs. INTCATCH begin building Villa Bagatta’s demonstration site in January 2018, when they installed the CSO treatment system comprised of a Salsnes Filter rotating belt filter system, a granular activated carbon filter and a TrojanUV3000PTP UV disinfection system. From January to October, CSOs were simulated using different combinations of raw wastewater and water from Lake Garda and put through the system. Now and until the demonstration ends in the year 2020, real CSO events are being treated by the system. 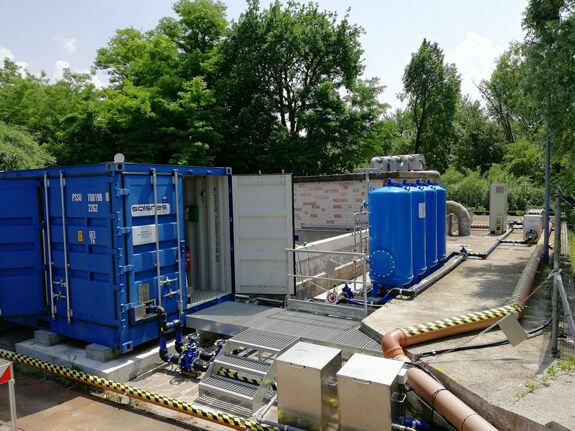 The demonstration site in Villa Bagatta, Italy: a Salsnes Filter rotating belt filter left in blue container, granular activated carbon filters center, and a TrojanUV3000PTP UV disinfection system far right. The Salsnes Filter system is housed in a 20 foot container. 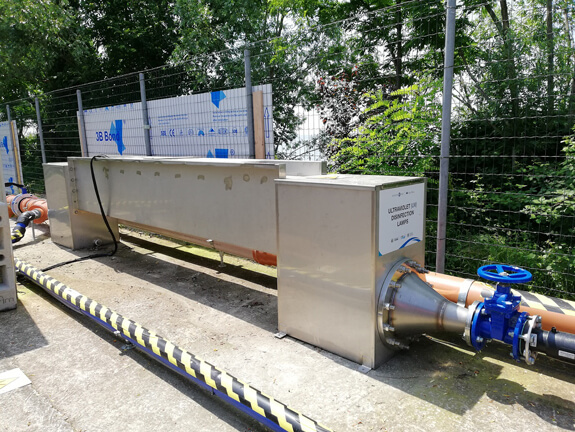 Inside, a SF1000 filter (with 90 micron filtermesh), polymer station, mixer and Control Power Panel treat flows up to 50m3/h, removing, on average, 39% of suspended solids. The SF1000 performs solids separation and then transports solids to its integrated sludge thickening stage after which sludge is dropped into a collection area. The Air Knife automatic cleaning system uses compressed air to remove any remaining sludge from the filter as it rotates. The Salsnes Filter system is housed in a 20 foot container and removes, on average, 39% of suspended solids from incoming flows. 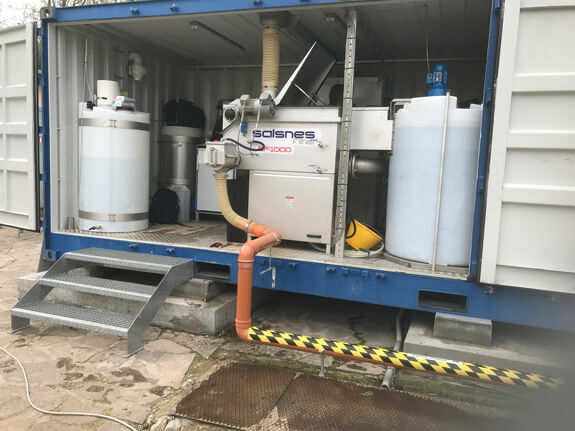 The TrojanUV3000PTP UV disinfection system is the final treatment step, destroying bacteria, protozoa and viruses before discharging into Lake Garda. UV disinfection is a physical process that instantaneously neutralizes microorganisms as they pass by UV lamps submerged in the effluent. The process is environmentally friendly and chemical-free; it adds nothing to the water but UV light, and therefore, has no impact on the chemical composition or the dissolved oxygen content of the water. The TrojanUV3000PTP UV disinfection system is the final treatment step, destroying bacteria, protozoa and viruses before discharging into Lake Garda. A number of monitoring tools are in place to show the efficiency of treatment equipment and its effect on lake water quality, including levels of solids/turbidity, pH, heavy metals and E.Coli. Remote-controlled boats and fixed sensors test the water in real-time and are linked to a decision support system (DSS) that helps improve day-to-day decisions about where, when and how to best help the lake. 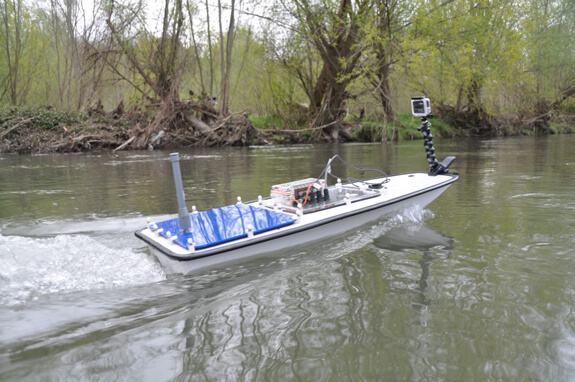 Remote-controlled boats test Lake Garda’s water quality in real-time. The INTCATCH program, using well-known and proven treatment technologies, combined with ultramodern monitoring tools, has the potential to help communities around the world reduce pollution caused by CSOs and improve the health of their water bodies. Once the Villa Bagatta demonstration ends in the year 2020, INTCATCH’s mission will be just that – to find other communities that could benefit from the innovative program they’ve built.